Whether you prefer classic or rustic, Minka Lavery offers a wide selection of unique designs to illuminate your space and elevate your home! We created a quick guide to finding the right Minka Lavery chandelier to pair with your decor. The refined lines, minimal ornamentation, and natural shapes of the mid-1900s led to some of the most iconic pieces in modern design. Contrasting materials had a big influence during the mid-century. Metal, glass, vinyl, and plywood were used alongside more traditional materials, such as wood. Color palettes ranged immensely, from neutral to bold palettes and often incorporating black and white graphics. Mid-century has made a comeback with the re-emergence of low-profile furniture and fixtures. Stay on trend with light fixture styles that suit, like the rounded Clarte Minka Lavery chandelier. Troy lighting is a name that stands out with both homeowners and interior designers. Once you get to know Troy Lighting sconces and chandeliers, it becomes easy to see why. 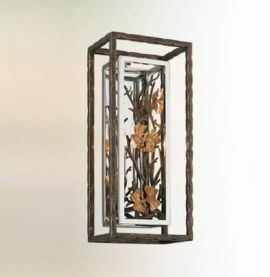 Troy Lighting uses the traditional method of hand forging to create their fixtures. When you look at a Troy Lighting chandelier or sconce, each part of its design was created by hand. This historical method of forging helps to retain both fixture integrity and quality. Whether your design style is simplistic or lavish, the perfect centerpiece can change the feel of an entire room. There is no better way to make a statement within your home than with a gorgeous light fixture. Combining both form and function, Hubbardton Forge chandeliers offer something for everyone, no matter your personal preference. The team of designers and engineers behind Hubbardton Forge chandeliers continually seek to push the boundaries to create truly unique light fixtures. If you’ve been seeking a chandelier unlike any other, you’ve come to the right place. Celebrating their 40th year, this company has proven to have the longevity of a trusted company—without their designs going stale in the process. Continually on the cutting-edge of modern design, Hubbardton Forge chandeliers vary greatly from traditional to contemporary styles, ensuring that each and every customer finds precisely what they’ve been looking for. The depth of character is made evident within each piece as the designers skillfully weave glass, iron, and antique chrome accents together beautifully. These lighting fixtures were built to last, and no element has been overlooked. The craftsmanship behind these fixtures is unlike most other brands because Hubbardton Forge uses hand-forged wrought iron in many of their designs. You may think that chandeliers are only for fancy schmancy hotels, mansions, and ballrooms, but chandeliers are actually becoming a fairly typical lighting fixture in many homes. Whether you have a lot of space to work with or are limited in the size of your space, a beautiful and elegantly crafted Minka Lavery chandelier will be the perfect addition to your dining room, hallway, or foyer. As any interior designer will tell you, the way a home is lit is a major factor in how it looks and feels. You can have the best designer furniture and interior design, but if you don’t have good lighting, your home will feel dull and even unwelcoming. Bad lighting can even cause people to feel depressed and uncomfortable in their homes because our environments truly affect the way that we feel. Make your place a bright and welcoming environment with the beauty and elegance of Hubbardton Forge sconces, Hubbardton Forge Chandeliers, and Hubbardton Forge Pendants. Hubbardton Forge’s simple yet elegant designs will be sure to brighten up your home with beauty and sophistication. These lighting fixtures come in a wide array of shapes, sizes and designs, and they will look great over a dinner table, a desk, a bar, or a kitchen island. You can purchase more than one of the same style of wall sconce to create a sense of uniformity in your bedroom or hallway, or you can mix and match difference lighting fixtures for a more eclectic design style. If you think chandeliers are only for the rich and famous, think again. While chandeliers might conjure up scenes of glamorous starlets descending down the long and winding staircases of enormous mansions, chandeliers are not only for large ballrooms or ritzy showrooms. In fact, a Hubbardton Forge chandelier is the perfect way to transform a room without going overboard with multiple lighting fixtures. Looking to add a little class to your dining room? You can do that without changing your furniture or curtains. Dining room chandeliers are a great way to add some personality and style to any room, and they aren’t just for grand rooms anymore. 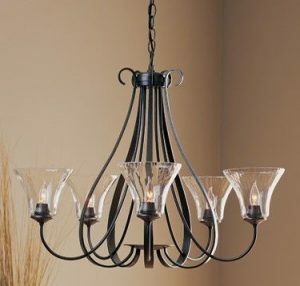 Crescent Harbor has a variety of chandeliers you can choose from, and they will completely transform an ordinary room into an elegant looking masterpiece. Chandeliers can add a beautiful and elegant touch to a dining room or foyer. Your eating area is a space that gets a lot attention from your family as it is probably the most used, and a chandelier can add interest and become the central focus of your room. The choices for chandelier design and style have also expanded a lot and you can find more traditional crystal chandeliers along with contemporary ones made with metal and other modern materials. You’ll also find that your dining room will be better illuminated once you install your new chandelier. Think about your theme and you can definitely find a chandelier to complement it. If you think chandeliers are only for fancy weddings or banquets, then think again. It is possible to get one installed in your home, and Crescent Harbor can help you pick the perfect style. We can make your home look beautiful, and our selection of chandeliers come in different variations. We have several tips on how to pick the right chandelier in order to give your home that little extra something. Nothing will add a touch of class and elegance to your dining room like a brass chandelier. With so many models and designs to choose from, we’ve got the perfect brass chandelier to match your style, whatever it is: elegant, fun, daring or modern. Brass chandeliers are the timeless look of dining room lighting. Why not choose one for your home today? We promise – it will never go out of style.